This tour is for the people who want to visit the beautiful white Cotton Castle while inside Turkey. A day trip to Pamukkale from Istanbul is perfect option to save time and money while travelling between Istanbul and Pamukkale. The unique calcium terrace and pools with hot spring water will amaze you during the tour on endless white path. Hierapolis Ancient Ruins City, Necropolis, Ancient Theatre, Thermal Pools, White Terraces, Travertine Pools, Byzantine Walls, Latrin, Tumulus Tombs, House of the Lonic Capitals, Martyrium of St. Philippus, Karahayıt Red Spring Water Terraces. NOTE: Please inform us if you want to add your flight to Pamukkale from Istanbul to the package. We will check the best prices of Istanbul Pamukkale flight for you and add to package with no extra profit. Visit Pamukkale in 1 day from Istanbul. 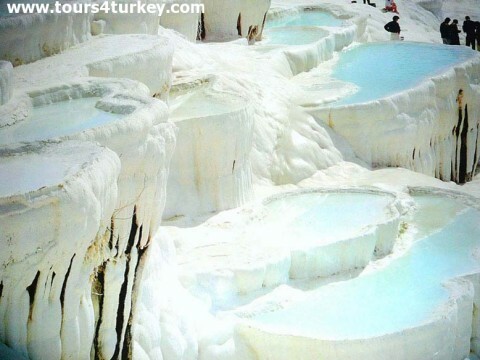 Pamukkale Tour from Istanbul on same Day.